Trim Detail by Wood & Co. The interior architectural details we select make a strong statement about who we are and make the difference between ordinary design and “classic ” design. The detailing makes a room whole – from the decorative beams, and the crown molding, baseboards, paneling, and chair rails to the stairs, and the floors under our feet – good detailing transforms a home from the ordinary to the “classic”. Usually these details are made of wood and center around molding and custom woodwork. The warmth and character of wood architectural details distinguish a home, and can make it spectacular. Typically these details in classic old world or European homes are derived from the “classical Orders” and attention to proper detailing is important. While the choices of materials and detailing are too numerous to cover in this blog, a good summary of the classical orders can be found in “Get Your House Right” by Marianne Cusato and Ben Penreath. They point out how interior detailing can range from high-style, fully classical design to a modest trim selection and point out that the classical Orders relate to the size of the room and the other elements in it. Plaster and stone were frequently used for detailing old world homes, but wood is most comonly used. As with the exrerior detailing we have discussed in previous blogs, interior detailing requires careful attention to proportions and materials in the context of the space and purpose. For the most part we are concerning ourselves with “traditional” detailing in discussing old world design. That, however, may vary depending on the style of home, be it French, English, Italian or classic American Heritage which may have characteristics of any of these. Our purpose is to provide information that may steer you to a variety of sources to suit the home design you have selected. Trim, inside and out, has a practical purpose as well as an aesthetic purpose. It accents what we want to beeseen and covers potential trouble spots resulting from the termination of or joining of two materials or surfaces. More significant trim may signify a more significant door or window, while less trim may provide a subtle accent wihout bringing attention to something less significant. The size of the space may dictate the size of the trim as well. It really is a matter of proportion and balance. Likewise, the shape of trim pieces indicate a level of importance or compliment an adjacent element in form or style. Trim detailing varries significantly from one area to another. Here we will address some of the more “traditional” interior trim detailing. Some of the trim or interior millwork that make up the overal composition of interior architecture include, the base (trim at juncture of the wall and floor), window and door casings (used to cover the joint between the wall and window or door), crown molding (where the ceiling and wall planes meet), sills, wainscoting, and chair rail (traditionally used to protect the wall from the backs of chairs). Each of these have shapes or “profiles” with a variety of “terminations” that transition the trim at the top, the edge or at the base. Window and door casings have three basic elements that result in distinctive, built-up profiles. These are: the termination in the form of a bead, quarter round or assorted profiles, the back band and the largest element, the flat. The size of each will be proportionate to the size of the space and of each element to the other. If the choice of profiles for base, trim and casing was not enough to complicate your decision making process, the size of the trim is another issue. One of the best ways to determine the best size trim is to mock-up two or three options at different sizes and shapes on site. It may be best to determine the trim and molding once walls have been framed in so any necessary blocking can be installed where extra support or nailing surface is required for larger installations. Ceiling trim may be a simple crown or a much more detailed, five, six or seven piece large combination detail cornice (LCD). It may help to know that a built up cornice may be composed of any number of components, but most combinations have similar parts depending on the size of the desired cornice. 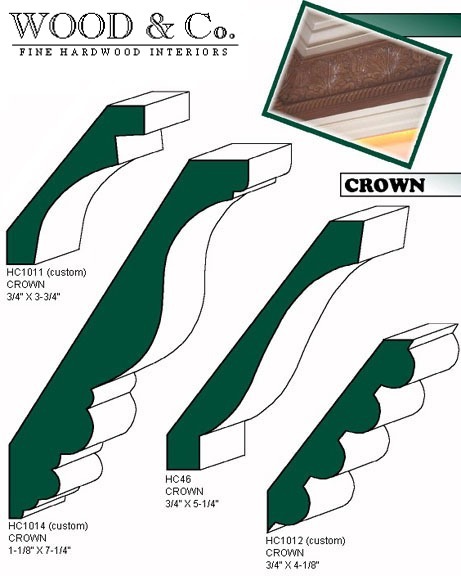 These parts are typically crown, frieze, bed, facia, soffit, blocking and cleats. Assembling and installing a cornice takes skilled trades people who are familiar with the process of assembling these parts and have the appropriate tools. Trim is available in a variety of materials affecting cost, usage and application. Consideration needs to be given to whether the trim will be painted or stained. The choice of finish may determine what material you should choose. Solid hardwood trim is a traditional standard for elegant, interior millwork, famous for its warmth and character. It has a reputation for quality and durability. In addition to its benefits it can have some drawbacks such as cupping and warping. Advantages include availability, strength, ease of coping, cutting, nailing, and finishing. A wide variety of solid shapes and curved moldings are available for any profile in a wide variety of wood species, grades and cuts including antique, imported and domestic. Finger jointed wood is knot free and less likely to cup than solid wood. It is available in 16 ft. lengths, and installs like solid wood. The finger-jointed process involves the joining of short lengths of timber to produce longer lengths, which can then be milled to the desired shape and equivalent to the strength of solid wood. If wood is to be stained, careful consideration should be given to the trim material as joints can show through the finish. Medium density fiberboard (MDF) may be a wise choice in lieu of wood if you are considering painted trim. These are are pre-primed and can save time and trouble. They have softer profiles, are easy to cut and take paint well. They are not suited for moist areas, can be fragile in small pieces, and not as easy to handle in long lengths. Some manufacturers provide a low emission Green Building compliant solution to MDF mouldings and boards. Synthetic trim is extruded or molded and can be cost effective, lighter, durable, workable, immune to moisture and more dimensionally stable, but lack some desirable characteristics of wood or workability of MDF products. For instance, they are more difficult to cope, require proprietary adhesives, and may not be available in lengths greater than 14 feet. Some are available in molded shapes and a variety of curves or flexible options. Plaster medalions are available in a variety of styles and replicate historically accurate designs. They are intended to complement embellished mouldings and add architectural detail to the well appointed interior. These old world plaster medallions are usually cast and feature highly sculptured plaster motifs. These are but a few of the many manufacturers of these products available today. Your trim provider or builder can describe the benefits of each in more detail and help you select the best option. Visit us at http://www.newsouthclassics.com/ for more ideas relating to building your traditional or old world home and a wide selection of plans. This entry was posted on April 9, 2010 at 10:15 am and is filed under Building Materials. You can follow any responses to this entry through the RSS 2.0 feed. Responses are currently closed, but you can trackback from your own site.